This is of course a ridiculous headline, but what makes it ridiculous? There are plenty of people who don’t believe in God after all. We make assumptions all of the time and a common one is that our leaders are in some way just a little bit superhuman. Too often we expect a level of perfection that few of us could match. Unless they are a wonderful orator, intelligent, reasonably good looking (or exceptionally if they are a woman) with a decent dress sense and a history of relationships that are without blemish, we are left disappointed or worse. Just look at poor Ed Miliband. He can say what he likes, but he can’t get away from his resemblance to Nick Park’s Wallace. It will forever hinder his political career. Is it the same for our religious leaders. Can we only allow them to have a concrete and unshakeable faith? Judging by the reaction to the revelations that Justin Welby, our Archbishop of Canterbury has occasions when he struggles to make sense of his belief in God, it would appear to be the case – in the media’s eyes at least. Are such thoughts really of such significance that they deserve to make the headlines? Apparently so. 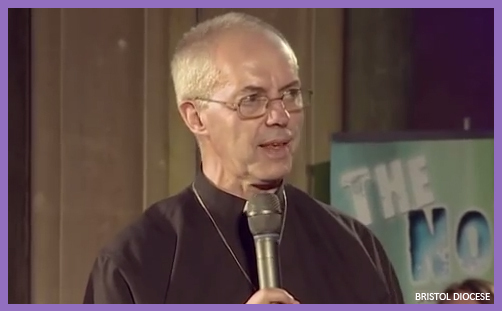 ‘Justin Welby doubts the existence of God!’ announced the papers and the BBC. Has it therefore been decided somewhere in the ether that Justin Welby has to have utter confidence in all matters of things spiritual? This says far more about a lack of appreciation of the nature of faith by those reporting his words than it does about Justin Welby himself. If we refuse to question our beliefs, whether they be religious or otherwise, the risk of fundamentalism increases dramatically. There is a reason why the religious right in the US is treated with such scepticism over here. Would those who hold to the ideologically blinkered views of groups like Islamic State be committing the evil horrors we have been seeing if they were open to questioning their beliefs and willing to entertain doubt? Why then too, do we refuse to allow our political leaders to admit to doubts in what they do without penalising them? Can we envisage a political climate where we see similar levels of genuine honesty from David Cameron? How much does he doubt himself in his abilities and role? We are unlikely to know the truth until he publishes his memoirs sometime in the distant future. Would not a bit more vulnerability actually be a good thing in politics here in our country? Just how offensive was Rowan Atkinson’s Comic Relief Archbishop of Canterbury? Thank God that finally a senior Christian admits to doubt! I fluctuate between doubt and faith frequently! It is the big elephant in the room that is never spoken about in evangelical circles – the other one being our finances! Great post. I am still questioning/lamenting the Cranmer and God and Politics merger, I think you both offer different perspectives and so whilst I understand the value and capacity advantages I wonder if it really is a wise/good move? Thanks Matt. This is a step out in faith. There are pros and cons to both staying and going. I’m just trying to follow where I believe God is taking me. Please bear with me and if you just want to read my posts, it’s easy to see the author at the new Cranmer website, or you can follow my tweets. Thanks for yet another adroitly handled oft-ignored issue. I note not only Gethsemane but also Calvary, for Jesus himself quoted poignant Psalm 22 during fatal torture. Am glad you quoted Justin’s factual response to his own hesitations in looking at the memorials or ‘altars’ erected in one’s life. It reminded me of when I was ditching church and God – both were ineffective ‘pie in the sky’ and I slammed my bible down in anger. It fell open and a couple of verses ‘jumped off the page’. They were just right! They explained precisely what was happening and why. So I knew God knew and would sort it all out! He’s a faithful and merciful, great and loving God. May I add to my previous Gillan? This may indicate how reverential respect for the awesome wonder of our Maker (ie biblical not psychological ‘fear’) is a foundation for understanding Him and the wisdom we can consequently gain. The verses I refer to above are Matt 10:35-39 and within hours of making that comment I heard our guest speaker refer to their first version at Matt 5:10-12! (This is ‘the sermon of the mount’ where Jesus gives his followers private tuition.) Our speaker stressed the fact that only the first and last of the beatitudes was given in the present tense. Therefore, when those situations apply then the Kingdom of God/heaven is (not will be) at hand, or accessible and active. I’ve long found that such ’coincidental’ fast repetitions are one of the ways God teaches those who love Him. Just as pertinent is this teacher’s focus in an earlier session on a revelation concerning psalms 111 to 117 for 2011 to 2017, the first of which closes: ‘The fear of the Lord is the beginning of wisdom; all who follow His precepts have good understanding’ (NIV). Amen! I was at Standing Room Only when Justin Welby made the comments you have reported. After being brought up in the church but having been away from any christian faith for over thirty years I found it utterly refreshing that he is like me. I have doubts and so does the Arch Bishop of Cantebury! I think you also need to take into account the context of his comments. He was speaking to 20 and 30 something’s who were there to learn more and therefore the comments were wholly appropriate. The fact that 70% of the audience were aged 50 and over does not detract from the fact that people my age and under need to contextualise their faith and find a way for it to fit with them. Justin Welby has done a great deal to help me achieve that, just in that short sentence. Your blog is fantastic by the way, thank you.